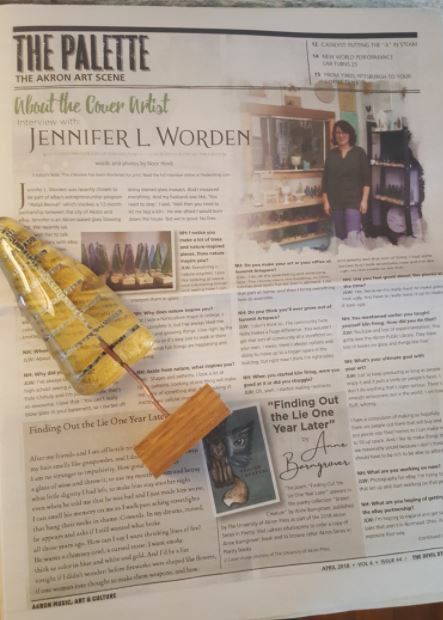 A vicarious thrill and no small amount of pride to see that the real talent in the family, the mother of my spoiled-rotten child, maestra of the molten glass Jennifer L. Worden lands the cover spot and featured artist interview in this month’s issue of Akron’s incomparable arts and culture magazine, The Devil Strip. Do check it out. And with that, hat’s off and innumerable thanks to the hard-working, unimaginably self-sacrificing management and staff who make our monthly Devil Strip fix possible. For three years Chris & the gang have bled the stones and turnips, squeezed the eagle (choose your miracle-working metaphor)—to keep the presses rolling. It clearly hasn’t been easy, and they could use a hand. If you have the wherewithal to help, please do. If not, please spread the word. 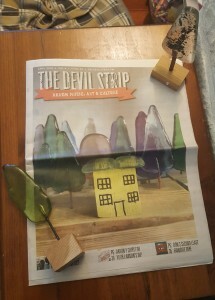 This entry was posted in New Post and tagged Akron, Art, Chris Horne, http://www.jenniferlworden.com/, Jennifer L. Worden, The Devil Strip. Bookmark the permalink.